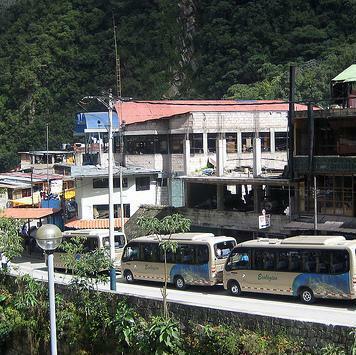 Once you reach Aguas Calientes, you need to take a bus ride to Ruins. There are plenty of buses there and you don't need to buy tickets in advance. Just go to the booth to buy the ticket. Once you reach destination by one of the train mentioned above, you need a bus ride. Yes, the trains will not take you directly to Machu Picchu. Actually train will take you Aguas Calientes town only. From this city Machu Picchu ruins is only few kilometer. It takes around twenty minutes to reach Machu Picchu from Aguas Calientes. But this short journey is really enjoyable as the buses pass through zigzag and winding way through the mountain. On the way the scenic beauty is great to enjoy. Walk to Machu Picchu ! But before I start talking about Machu Picchu you need to know, can you walk the road between Aguas Calientes and Machu Picchu ! Yes , you can, it will take you around 60/80 minutes and distance is around 6 km , if you can stop at Puente Ruinas Station, which is at the end of Aguas Calientes city, then the distance is only 3 km. Though the route is not very enjoyable, but you will always find some adventure loving folks walking the way up or down. But my advice is don't walk while you are going there, you may walk while you are coming back to Aguas Calientes, because it may tire you , and it will be difficult to walk within the ruins later, if you walk while going up. Trains stop at two locations at Aguas Calientes. Machu Picchu Pueblo Train Station is at city center. Just opposite to this station you will find the first bus station. It is not a station actually. There is a small booth where you can buy your tickets for the bus ride. Bus start from nest to the booth. Usually the visitors who plan to stay nights at Aguas calientes stop at this train station. Once they get fresh from hotel, they comeback and start from this bus stop. If you are visiting Machu Picchu just for one day, you should stop at Puente Ruinas Train Station. Puente Ruinas is located at the end of the town and closer to Machu Picchu ruin. The second bus station or bus stoppage is located opposite to this station. 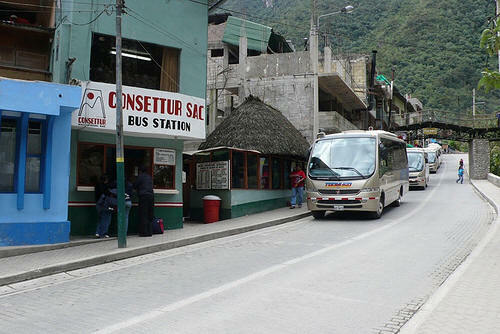 If you are the day visitor, then you don't need to go to Aguas Calientes town. Just get off the train, be on the line for the bus ticket, and take the bus to the ruin. Here the buses start early in the morning. If you want to be one of the very first ones in Machu Picchu reach here before 5.10 am. Very soon you will see a big queue here. Buses depart this stoppage every 20 minutes, until 5.30 pm. Tickets are $ 4.50 one way or $ 9.00 both way. Puente Ruinas Train Station is located at the end of the town. Machu Picchu day visitors stop at this train station. From here Machu Picchu citadel is very close. After jumping off the train you will see a small ticket booth opposite to the train station. Buses depart from this stoppage Every 15 minutes. Tickets are $ 3.00 one way or $ 6.00 both way from here. If you want to save time you can buy your bus ticket in advance. You can buy the tickets in Cusco also. You have to go to Consettur offices in Cusco which is located in Avenida Pardo, opposite Parque Espana. Just a few minutes from the Main Post office in Cusco. You can buy the tickets from Aguas calientes the night before. If you stop at Puente Ruinas, it is easy to get the ticket booth, which is just opposite to the train station. Trust me, you will not miss it. But if you stop at Machu Picchu Pueblo Station, which is at the center of the town, you need to know the location of the ticket office. Once you get off the train station just walk along the tracks. After a short walk you will reach a bridge, pass the bridge and take a right turn and you will see a blue building ion your left, this is the ticket office. Most of the people will take a left turn after they pass the bridge to catch the bus, as they already have the ticket. So if you follow the crowd you will lose your precious time. If you are day visitor to Machu Picchu, try to buy both entrance ticket and bus ticket from Cusco. I stopped at Puente Ruinas Station from train, then I realized I need to buy the entrance ticket from Aguas Calientes, So I went back to Aguas Calientes by bus, bought the ticket for citadel entrance and then came back towards Machu Picchu. I lost most of my day on these..